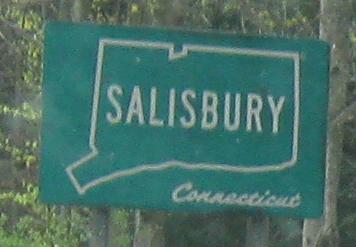 The first major town in CT encountered by 41. Lakeville and Sharon are the other two, and that's it. 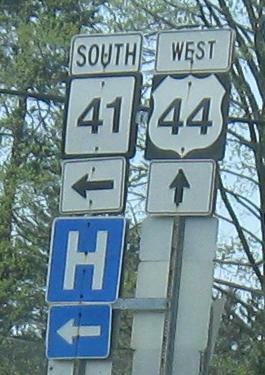 The US 44 WB photo I have at CT 41 is clearly visible from CT 41 SB, just to the left of the assembly in the third photo. The multiplex signs date to the 1980's when CT experimented with a strange font and untold drugs. 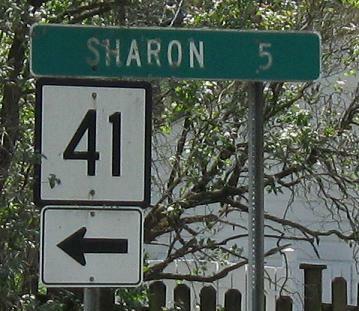 Sobering up, someone remembered that CT 41 was the original alignment of New England 4 and US 7, and decided to sign the Alternate route for 7 down this road (and presumably back via CT 4, the old 7 route). 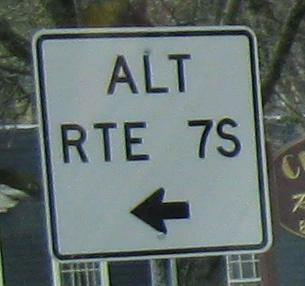 Problem is, this is the only ALT 7 sign. 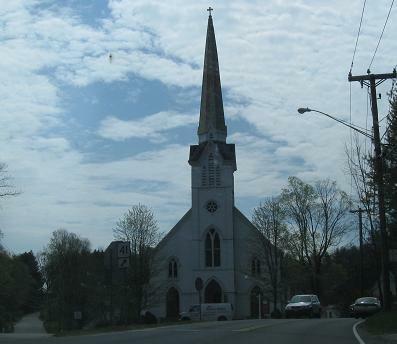 Leaving Salisbury, past the church at the corner of Wells Hill Rd. in Lakeville, and then past scenic but hard-to-remember Wononskopomuc Lake. 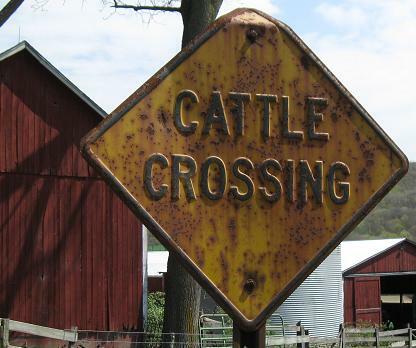 One more interesting sign in CT on Amenia Union Rd. 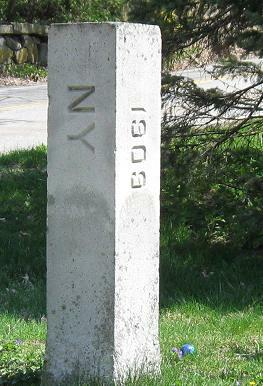 The southern and northern faces of the centenarian border stone that marks the end of CT 41 and of Leedsville Rd. 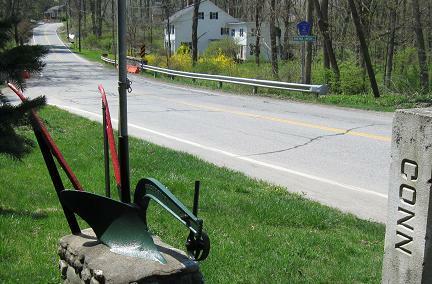 Amenia Union Rd. continues on in New York, taking Dutchess CR 2 away from Leedsville Rd. For some reason, some fashion of plough (note the old spelling) sits on the border as well. This is facing southwest. 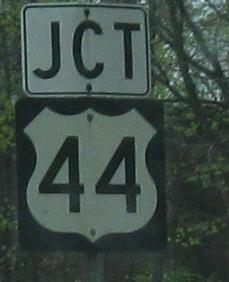 CR 2/Leedsville Rd. 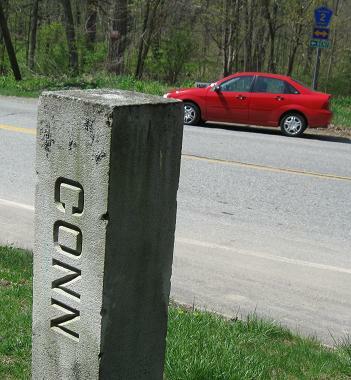 SB, a ConnDOT assembly that may or may not actually be on their side of the border. 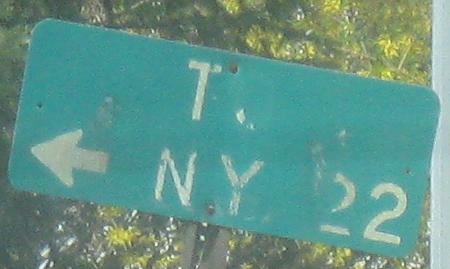 Not quite up to snuff, but definitely on the NY side of the border, intended for CT 41 SB traffic.